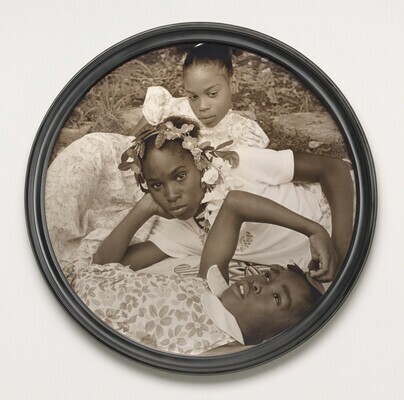 May Flowers, a compelling photograph of three young African American girls, succinctly addresses the issues of race, class, and gender that the American artist Carrie Mae Weems (b. 1953) has explored for more than 30 years. Part of a series Weems made in 2002 (titled May Days Long Forgotten, evoking both spring’s renewal and the May Day celebrations of International Workers’ Day), May Flowers depicts girls from working-class families in Syracuse, New York, wearing floral-print dresses. Its tondo format, truncated foreground space, and tight focus on the figures harks back to Renaissance paintings of the Madonna and child, while its subject—adolescent girls with flowers in their hair, lounging on the grass—recalls both 19th-century paintings and photographs, such as those by Julia Margaret Cameron. Weems intensified this historical character by printing the photograph in sepia tones and placing it in a circular frame that makes the piece seem as if it would be perfectly at home in a nineteenth-century parlor. Yet, the color of the girls’ skin belies such a history, even as their beauty and knowing expressions—especially the authoritative look of the central figure—challenge viewers to question why they have been excluded for so long. Further complicating and enriching the work, Weems glazed it with a piece of convex glass of the type commonly used in 18th- and 19th-century mirrors, as if to suggest that the image represents a reflection of the world at large. May Flowers is the first work by Weems, who won a MacArthur Fellowship in 2013, to enter the collection of the National Gallery of Art. It was acquired with the Alfred H. Moses and Fern M. Schad Fund. Like other recent additions to the collection from artists such as Kerry James Marshall, Glenn Ligon, and Byron Kim, it is a powerful statement on the role of race in American society. Carrie Mae Weems; NGA purchase (through Jack Shainman Gallery, New York), 2014. The Memory of Time: Contemporary Photographs at the National Gallery of Art, Acquired with the Alfred H. Moses and Fern M. Schad Fund, National Gallery of Art, Washington, 2015, no. 3.